After an epic lunch at Odette, the contemporary French fine dining restaurant at the National Gallery Singapore, my friend and I walked around the museum. 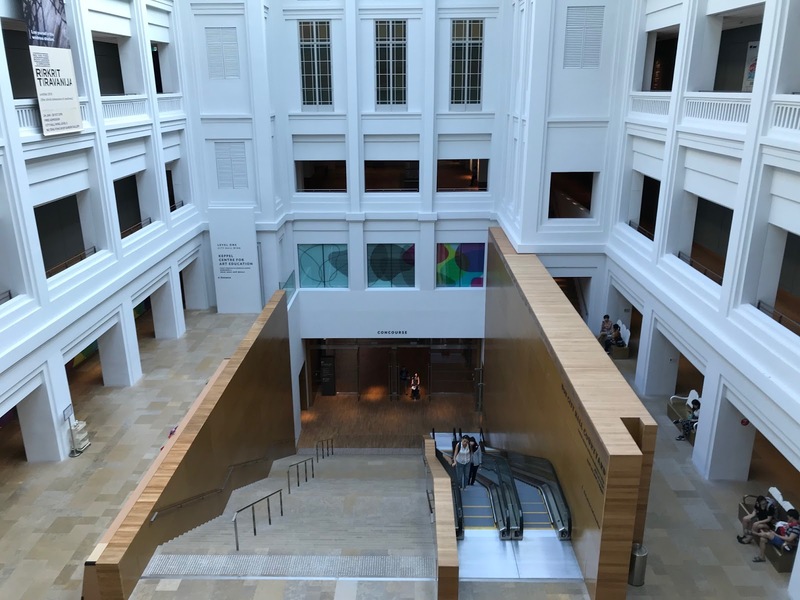 I came here over two years ago and was very impressed by the renovation of the Supreme Court Building into a beautiful space that has a lot of room for people to wander and many restaurants and cafes. We checked out one exhibition in particular -- (Re) Collect: The Making of our Art Collection. 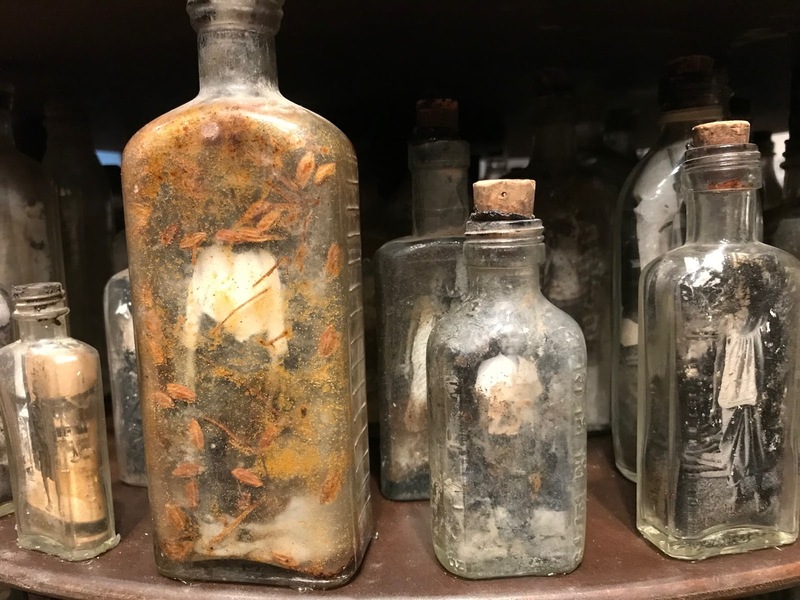 The museum went through its collection of over 8,600 pieces and showed almost 130 of them that demonstrate how it has evolved since the 1960s. In it there are works by various Asian artists not only from China like Zao Wou-ki, but also Indonesian, Malaysian and of course Singaporean. 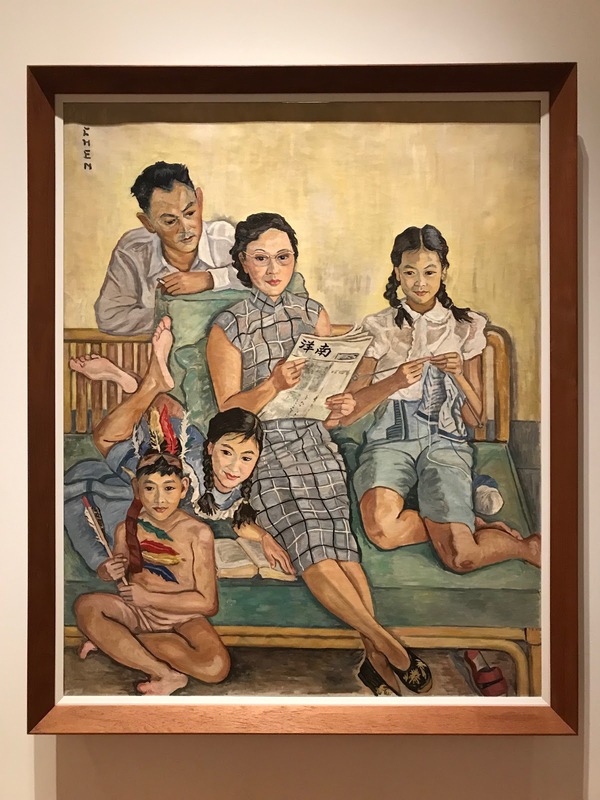 One of the artists that caught my eye in particular was Georgette Chen (nee Chang Li Ying) (1906-1993), originally from Zhejiang province. Her father was an antiques dealer with businesses in Paris, London and New York. He was also a supporter of Dr Sun Yat-sen, which is why Chen and her 11 siblings -- yes a family of 12 children -- were encouraged to speak Mandarin at home and were sometimes taken on trips to China to see the revolutionary effort. As she was born into a privileged household, she was allowed her to follow her interest in art and even went to Paris and New York to study. She eventually settled on Paris, where she met Eugene Chen, a Chinese diplomat and friend of Dr Sun. Chen was also an art and music lover who encouraged Georgette's art career. They married in 1930. However, during the Sino-Japanese war, they were imprisoned and her husband died in 1944 in Shanghai. She moved to Singapore and her art focused on still lifes, landscapes, and the human figure. In the exhibition there are some of her works, including one called Family Portrait. It features the family of Chen Fa Shin, a long time family friend of the artist. The description of the work explains the family was close to her as indicated by their relaxed postures. 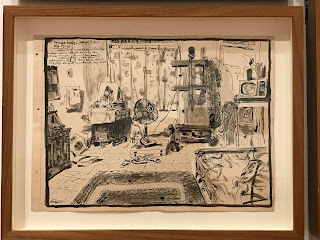 Each family member took turns posing for her, as she sketched them in charcoal and then she painted over the lines with oil. Chen also became a teacher at Nanyang Academy of Fine Arts for many years. Another interesting artist is Indonesian artist S. Sudjojono (1913-1986). The museum presents a series of ink and watercolour sketches that look like the precursor to infographics. 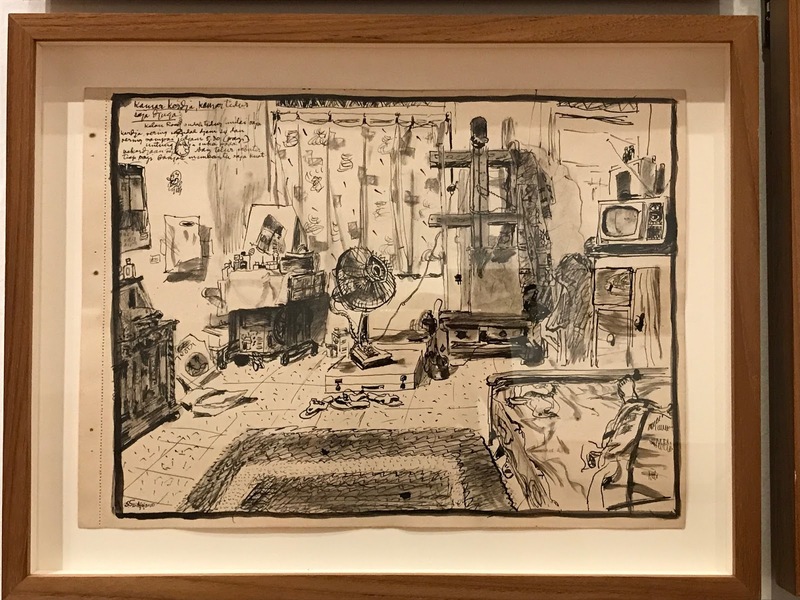 The sketches are so intricate and include some text. They are observations of daily life as well as portraits and urban landscapes. One particularly intriguing work is by Thai artist Navin Rawanchaikul (b. 1971). 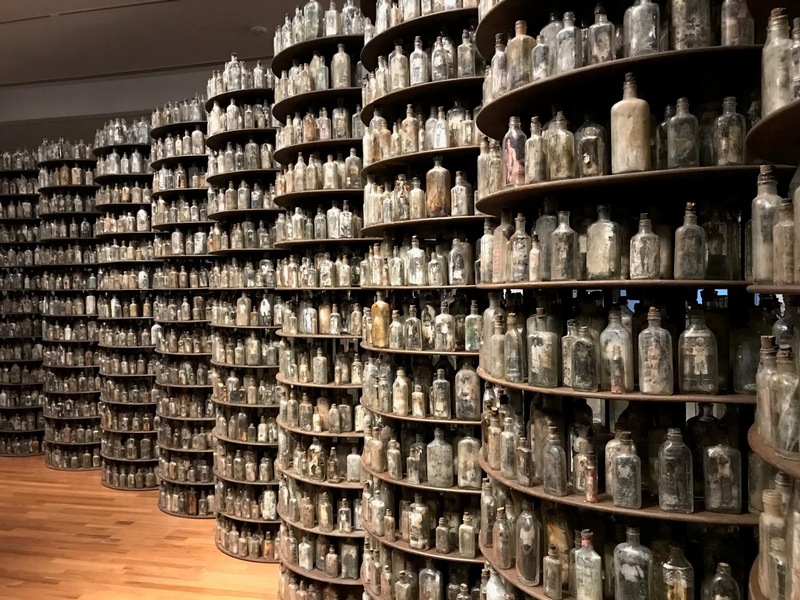 His art installation, Asking for Nothingness looks like a massive collection of old medical bottles stacked up in several circular shelves. 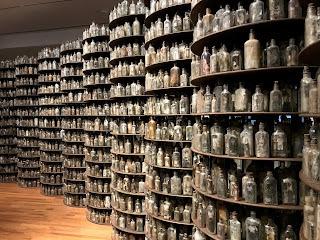 But when you walk behind the stacks, the bottles aren't empty -- they are filled with black and white photographs of elderly people. You can't really see their faces and you're not meant to. The artist is shining a spotlight on how society neglects the elderly and illiiterate caused by rapid modernization. This is Rawanchaikul's attempt to preserve the seniors' stories, reaffirming their cultural value in society. It's a pretty eerie piece, but it's provocative and forces you to think of all these people, shoved in the back of a cabinet and forgotten. The National Gallery Singapore also has amazing views on its top floor. When you emerge from the elevator, the roof actually has water running on the glass ceiling and it creates a beautiful reflection of the urban landscape nearby. The rooftop area also provides great views of Marina Bay Sands, the exhibition centre and a massive grassy area for cricket. Of course there are restaurants and bars there for guests who want to eat and drink while taking in the view.